The "shufflebuilding" game Smash Up starts with a simple premise: Take the twenty-card decks of two factions, shuffle them into a forty-card deck, then compete to smash more Bases than your opponents! Each faction brings a different game mechanism into play – pirates move cards, zombies bring cards back from the discard pile, dinosaurs have huge power – and every combination of factions brings a different play experience. During play, Base cards (each with their own difficulties and abilities) are in play. You attempt to have the most power on the Base from your minions when the Base is smashed. Sounds easy? How easy is it when an opponent's Alien-Ninja decides to Beam Up your minions to other Bases - flat out Assassinate them? What about when the Pirate-Dinosaur player Full Sails in and releases King Rex to stomp your minions into the ground, or when the Wizard-Zombies use their Mystic Power to create an Outbreak, suddenly flooding minions onto the Base from the discard pile? Or what if you faced a Zombie-Dinosaur player instead and he created an Outbreak of massive beasts all at once?!? When a Base is smashed, each player in first, second and third place scores points. Fourth place? Sorry, bro – try harder next time. 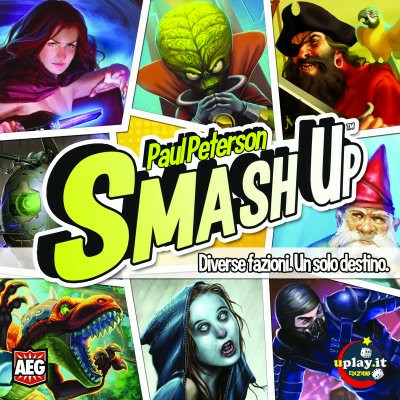 With eight different factions, Smash Up includes dozens of combinations to try. Pirate-Aliens play different than Ninja-Aliens, for instance. Which will you use to smash up your opponents? And did we mention the dinosaurs have laser beams?